Could GM Ted Thompson learn a few things from the New England Patriots? ~Since his Patriots lost at Denver in final seconds in the AFC Championship game, Bill Belichick hasn’t waited until the draft rolls around to make improvements to his football team. Bill Belichick drafted Rob Gronkowski in the second round back in 2010. In the past few weeks, the Patriots have utilized a thing called free agency, as well as another legal method called trading. 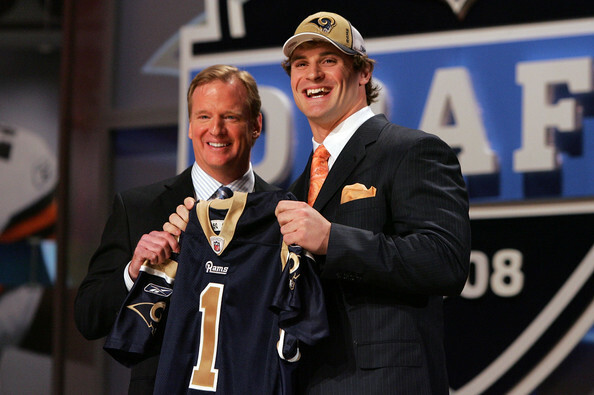 Chris Long poses for a photo after being selected second overall by the St. Louis Rams with National Football League Commissioner Roger Goodell during the 2008 NFL Draft on April 26, 2008 at Radio City Music Hall in New York, New York. The Packers selected QB Brian Brohm in the second round of this draft. They’ve added former top-two overall pick, Chris Long to the defensive line. That was the same draft with Jordy Nelson, by the way. So it’s not like Long is ancient. They’ve added a recent top-ten pick, 26- year old Jonathan Cooper, to the offensive line. 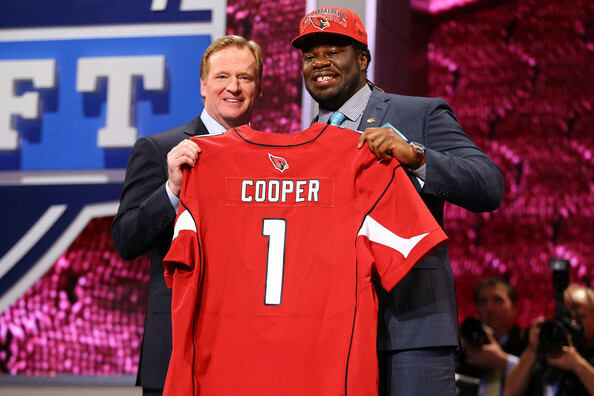 Jonathan Cooper of North Carolina Tar Heels stands with NFL Commissioner Roger Goodell (L) as they hold up a jersey on stage after Cooper was picked #7 overall by the Arizona Cardinals in the first round of the 2013 NFL Draft at Radio City Music Hall on April 25, 2013 in New York City. Cooper has not panned out yet in Arizona as planned, mostly due to some injuries. But this is the kind of addition that is pretty low risk, that could reap big rewards. He’s still very young. They’ve added a former starting running back, and a good receiving back, Donald Brown. They’ve added another wide receiver, Chris Hogan, from Buffalo. This has the looks of another Wes Welker, Julian Edelman type of move for them. Here’s another example of adding talent before the NFL Draft, with a low-risk, high reward potential. Shea McClellin was the Bears #1 pick just four years ago, taken #19, before the Packers were rumored to have been ready to grab him. Playing out of position, he’s not paid dividends for the Bears, aside from breaking Aaron Rodgers’ collar bone in 2013. Now look for him to become a key contributor for the Patriots defense, and it allows them to draft other positions, not have to worry about filling one hole. Thompson thinks he can draft so much better, he can plug all his holes with draft picks, and undrafted guys. This is why when one guy goes down, like Jordy Nelson, the offense becomes a shell of its’ former self. Imagine Clay Matthews going down for the year. The defense will suddenly fall apart, as the offense did last year. And pundits will be asking “What’s wrong with the Packer defense” as it did last year of the offense. Crappy depth at certain positions, and lack of playmakers at certain positions. Filling depth with undrafted guys, and late round draft picks, instead of with former high picks, more talented guys, leads to that at times. It’s no accident that Belichick has been to six Super Bowls since 2001 began, while Thompson has just the lone one, despite landing Aaron Rodgers 11 years ago. 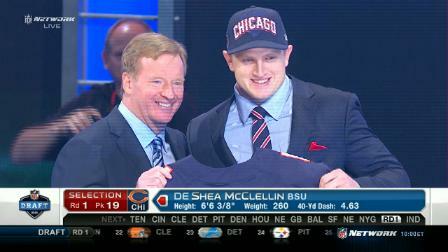 They also just signed former first round linebacker Shea McClellin. He was the guy a lot of people believed the Packers were going to draft four years ago, but the Bears unexpectedly took him earlier even though they played the wrong scheme for his talents. The Patriots, and Packers, play the right one. Again, despite adding that talent to the roster this off-season, they also will draft. Yes that’s right, you are allowed to do both. Adding some good talent, proven in the NFL, doesn’t mean you forfeit your right to draft players. Remember, the Patriots were the Super Bowl Champions last season (2014-2015), and finished a two-point conversion from potentially going back to the Super Bowl this February. They’ve also been to five other Super Bowls in the Tom Brady era, winning three of them and losing two thrillers to the New York Giants. Each time the Giants won the Super Bowl, they knocked off the Packers along the way, and at Lambeau Field. RB Steven Jackson (FA 2015), former first round pick, gotten cheaply, no risk. 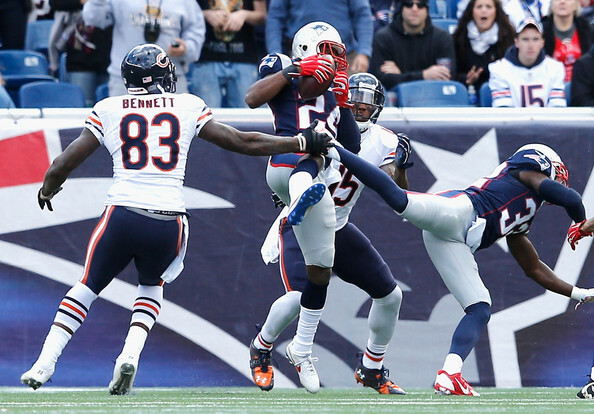 Darrelle Revis #24 of the New England Patriots intercepts a pass during the second quarter against the Chicago Bears at Gillette Stadium on October 26, 2014 in Foxboro, Massachusetts. Revis wasn’t there long, and he did cost a LOT of money, but he helped that defense tremendously. Without him, they probably wouldn’t have won that Super Bowl 14 months ago. Think about that. And they aren’t in salary cap hell as a result, like some Thompson-defenders seem to think happens if you sign great players via free agency. Veteran free agent role players have been a huge part of New England’s roster-building since 2001. Sheard was another somewhat quiet signing, but the former #37 overall pick in the 2011 draft made an impact on the Patriots, getting four sacks in his first four games. He finished the season with eight, and forced four fumbles. This is a smart strategy taking good, but still young enough, talent off poor teams like Cleveland. He’s still only 26. Now watch McClellin turn into a solid player for the next few years, with the Patriots basically stealing the former first rounder, from another sub-par team, the Bears. Last season’s championship team, Alan Branch, LeGarrette Blount, Sealver Siliga and Brandon LaFell were among the crucial acquisitions, in addition to the big ticket stars like Revis. Almost their whole defensive backfield was comprised of new additions from other clubs; Revis, Browner, Chung, and Super Bowl hero Butler. Belichick never stops looking for a place to upgrade; Akeem Ayers and Jonathan Casillas were two role players picked up in midseason trades that have helped along the way. From 2011 until 2014, (the recent two seasons New England made the Super Bowl) just a three year span, the roster turned over an incredible amount. Only 16 Patriots who suited up on Super Bowl Sunday 2015 were on the team that lost to the New York Giants in Super Bowl XLVI just three years earlier. As long as they have Tom Brady and Robb Gronkowski, they have a chance. It’s much the same in Green Bay with their #12 & #87 combo. And each of the four guys were original draft picks. Only Rodgers was a first rounder, incidentally. Both of the #87 targets, Nelson and Gronkowski, were second round picks. Brady, of course, was the best sixth round pick ever back in 2000. Those similarities of the key guys, #12 and #87 are pretty much the only parallels. Each team will always have a chance to win a Super Bowl as long as these #12’s remain healthy, although they each need their #87 healthy too. But those guys are now entering their ninth (Nelson) and seventh (Gronk) season, and slowdowns would not be surprising. Whereas Belichick is not afraid to turnover his roster frequently, and add veteran players from other teams, Thompson seems almost afraid to bring in anyone else, aside from street castoffs. One Super Bowl Championship. Don’t take that for granted. Nobody has more than two titles in the last 10 seasons, and some franchises have ZERO in their history. Isn’t that right Grape Apes to the west, Minnesota? Made the playoffs for seven straight years, tied with Patriots for longest active streak in NFL. Some teams have made it zero times in these seven seasons. Appeared poised for possible Super Bowl last year (2014) before losing Nelson for the season in a meaningless preseason game in August (Patriots offense was also in shambles when they lost their #87 to an ACL three years ago). Beat the Patriots in 2014 and outplayed Seattle in the NFC Championship game for 95% of the game, and would have won if Brandon Bostick either could follow instructions, or catch. That was the best team assembled in the NFL, despite the choke-job the final five minutes. You cannot pin any of that on Thompson. Despite losing Nelson, and struggling on offense for most of 2015, still came one two-point conversion on the last play from making it to another NFC Championship game. Instead, lost in overtime. 2011 team should have repeated, but he let Cullen Jenkins go in free agency, and expected his shoes to be filled by an unknown. The first defensive lineman he took that draft was in the seventh round, Lawrence Guy with the 233rd pick. Jenkins did very good that year in Philadelphia, and missing him and the big fella Howard Green proved to be crucial in the end. Always is two or three years behind filling obvious holes; safety after losing safety Nick Collins in week two of the 2011 season, and at Inside Linebacker after losing Desmond Bishop in the 2012 preseason opener. He waited until 2014 to add a legitimate talent at safety, and he still hasn’t added a true talent at LB now four years later. Has had chances to obtain difference-makers, on a silver platter. Oakland tried to send Randy Moss to Green Bay in 2007 (year before Rodgers Era began), and Buffalo tried to send Marshawn Lynch to Green Bay in 2010. New England was willing to give just a little bit more to get Moss. Same thing with Seattle for Lynch. Think about those 2007 Patriots without Moss. And imagine Seattle the past five-six seasons without Marshawn. Thompson valued his picks just a little bit too much. And for those who think Moss was too old at that time, he was the same age then as Jordy Nelson is now. Moss broke the all-time TD record for a season that year with Brady throwing him bombs. Other than the magical 2010 Super Bowl run, the team has not won more than one playoff game in a season. Their lone playoff wins came against a Vikings third string QB who later was moved to a different position, vs the Redskins who never beat a team with a winning record all year, and the Dallas Cowboys in that 2014 NFC Divisional that Dez Bryant didn’t make that catch. They are 3-5 in the playoffs in the five years since the magical 2010 Super Bowl run. Aaron Rodgers masks a lot of ills on this team. When he was out with the broken collar bone in 2013, the team looked horrible. The players that fans thought were talented, appeared to be scrubs. The Lions outgained the Packers about 550 yards to 90 at one point on that 2013 Thanksgiving game. And that was with a healthy Nelson, Cobb, Jones, Lacy, Offensive line, Matthews, etc. The 2008 Patriots lost Brady in week one to a torn ACL, and their backup QB Matt Cassell, who had not even started a game since high school (was a college backup at USC his whole time there), went 10-5 in his 15 starts. Ted Thompson is one of the better drafters in the NFL, there’s no doubt about that. But he’s not the best. And he’s surely not great enough at it to compensate for not adding talent in the manner that the Patriots do. Or that the Seahawks do. Besides trading for Lynch (which was paramount; without him they don’t sniff a Super Bowl), they also added defensive linemen Michael Bennett and Cliff Avril, from poor teams. Yes, Thompson added the great, but old, Julius Peppers in the 2014 off-season, and he’s played well for two years since, justifying the addition. But at the same time, the Broncos also added an almost-as-old pass rusher of their own, Demarcus Ware. They also added defensive backs Aqib Talib, TJ Ward, and WR Emmanuel Sanders. Oh, this in addition to adding QB Peyton Manning via free agency back in 2012. Drafting is very important. But no matter how good Thompson drafts, he’s always going to have misses. He’s misfired with first round picks like Justin Harrell. He’s whiffed on second rounders like Jerel Worthy. Nick Perry and Datone Jones have been so-so as first round picks. He traded up to select inside linebacker Terrell Manning, who was a flop. He also thought that Maine’s Jerron McMillian was the answer at safety, using a fourth round pick on him in 2012, the first draft after losing Collins. In that same 2012 draft, many Packer fans were clamoring for Notre Dame’s safety Harrison Smith to be the choice. He was available at #28 when the Packers picked. Instead, Thompson chose defensive lineman Nick Perry, and made him a stand-up outside linebacker. Smith went the next pick at #29, and he’s solidified that back end of the Vikings defense. Thompson used his next pick, round two, on Jerel Worthy. Reggie Nelson, at age 28, was a talented but affordable option as a free agent at that time. He’s played great since then. New England and Denver have filled holes via free agency, gambling on guys who have shown in the NFL that they can play at this level. All college players are unknowns. Projecting any collegiate kid, whether he’s from Western Michigan like Greg Jennings was, Maine like Jerron McMillian was, Saginaw valley State like Jeff Janis is, or Alabama like Trent Richardson, Eddie Lacy, Mark Baron, and Dee Milliner are more guesswork than signing a player already at the NFL level. The Packers have had an obvious hole at tight end and inside linebacker for a few years now. Since Jermichael Finley‘s career was unfortunately ended early, there hasn’t been a Packers tight end run past anyone, whether he’s a linebacker or a safety. This year, there were some very talented, and still young (30 or under) tight ends available on the free agent or trade market. Guess who added them? New England added Martellus Bennett, New Orleans added Coby Fleener, and Pittsburgh added the gem of the group, Ladarius Green. They are NFL-proven players, not college guesses. You think Brady, Brees, and Roethlisberger are a little more excited over those new toys than Rodgers is about his tight ends? Ah, what do those teams know about tight ends in the NFL anyway. Oh wait, they turned Gronk, Jimmy Graham, and Heath Miller into perennial Pro-Bowlers. 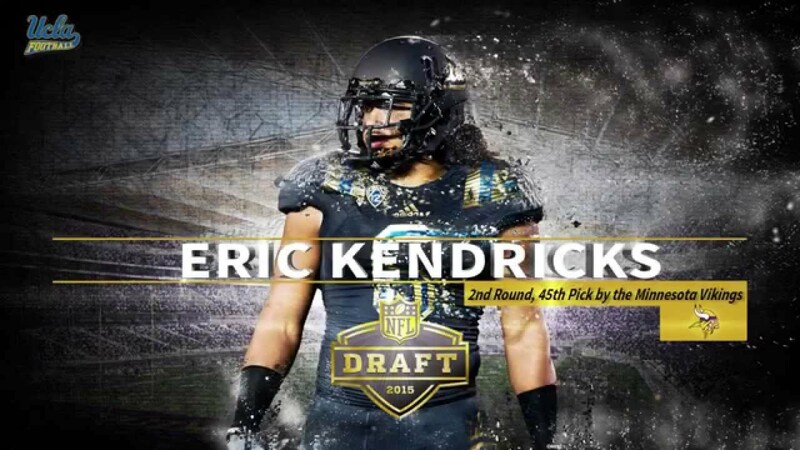 Eric Kendricks looks like a second round gem ILB, as Bobby Wagner has become in Seattle. Last year, most Packer fans were expecting, and wanted, one of the inside linebackers to be the Packer first round pick when the Packers were on the clock. They had their choice of any of them. Denzel Perryman from Miami, Eric Kendricks from UCLA, Stephone Anthony from Clemson all were guys rated among the top-twenty by many analysts. Many predraft mocks from the experts like Kiper, McShay, Mayock, and others at NFL.com, CBSsports, etc. had the Packers taking Anthony and Kendricks. Many mocks had Perryman already gone by the Packers pick. However, they were all still available when the Packers pick was up. Instead, the Packers took a solid defensive back, Damarious Randall, from Arizona State. Randall looks like a good pick, a good player. You can’t fault that pick. However, Kendricks looks like a force for years to come inside the Vikings defense (right in front of Harrison Smith). Perryman and Anthony appear to be fixtures in San Diego and New Orleans, respectively, going forward. Meanwhile, the Packers still need an inside linebacker, or two, a year later, and this draft crop doesn’t appear to have anyone nearly as good as those mentioned from last year. This crop of tight ends appears weak as well. The free agent crop of tight ends was above average. This includes Bennett, who wasn’t a free agent, but was made available. New England was happy to reel him in, even though they already have the best in Gronk. So did Thompson add a proven NFL inside linebacker this spring in free agency, like Danny Treyvathon? Nope, he went to the Bears, and he said the Packers never contacted him. The Bears also added another ILB in Jerrell Freeman. Those two were rated number two and three among all ILBs last year in the NFL, per Pro Football Focus’ grading system. Only All Pro Luke Kuechly graded higher. Now the Bears don’t have any hole at ILB to spend draft picks on, and they can use their picks at other positions. Thompson, instead, will rely on the same cast as last year, with a possible rookie added. However, aside from Reggie Ragland, there doesn’t appear to be any inside linebackers in this draft who can be day-one starters, upgrades. Raglend, unfortunately, will most likely be gone before the Packers pick. In 2010, John Schneider was Ted Thompson’s right-hand man, in Green Bay. Then Seattle signed him away to be their GM starting with that 2010 off-season. In 2010, Schneider completed 284 roster transactions, including adding Marshawn Lynch to be their bell-cow. On February 2, 2014, the Seahawks won Super Bowl XLVIII, their first championship in their existence. 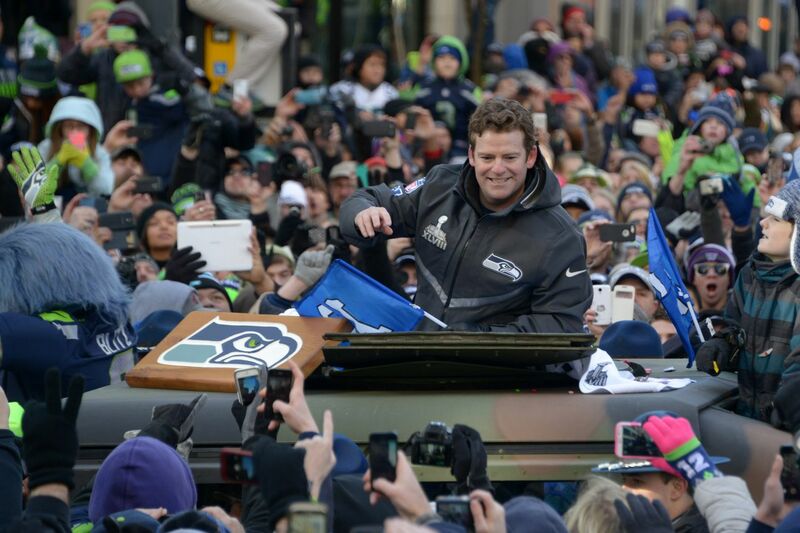 Of those on the championship roster, only four players, Max Unger, Red Bryant, Jon Ryan and Brandon Mebane were Seahawks prior to Schneider’s arrival in Seattle. Think about that. He built that in four years in today’s NFL. Schneider and Seattle followed their Super Bowl win with another Super Bowl appearance, but lost to New England in Super Bowl XLIX on a last-second error by the playcaller, and great play by the Patriots cornerback. It remains to be seen, but it appears that perhaps the Packers erred in letting John Schneider go, and sticking with Thompson. Since Schneider left, he added Marshawn Lynch, and drafted Russell Wilson, Richard Sherman, Earl Thomas, Kam Chancellor, Bobby Wagner, among others. He also stole Tyler Lockett last year. Seattle has made two Super Bowls, winning one, while the Packers have gone 2-3 in post-season, since the 2013 season began. In other words: Schneider has drafted better, and he’s added more and better players via free agency, such as Michael Bennett and Cliff Avril. 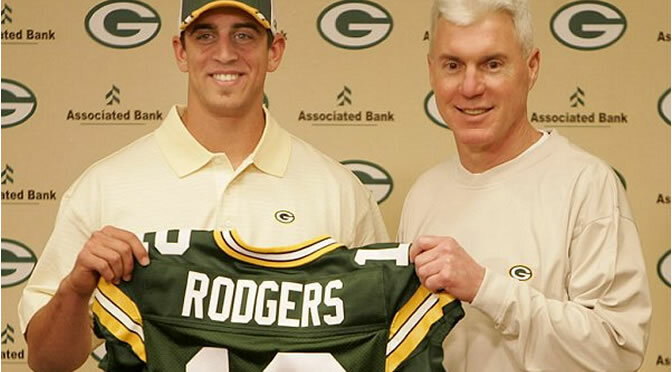 Look, Ted Thompson hit a grand slam in his first ever draft, first pick, in 2005 when Rodgers was “supposed to” be the top overall pick, and he somehow slid all the way down to the Packers at #24. Yes it took guts for Thompson to grab Rodgers in his first draft, when Favre still was trying to get the Packers to Super Bowls. But it also took a lot of luck for Rodgers to slide that far in the first place. Where would Thompson be right now had someone had been smarter and taken Rodgers before? A clue might be the 2008 Draft when Thompson used a second round pick to select Brian Brohm from Louisville. I actually believe his trade for Matthews in the 2009 draft was a more brilliant move. Clay is a superstar, very much under-appreciated by many. Many Packer fans take Matthews for granted, and probably will until he suffers an injury that ends his season, like so many other Packers have had. But overall, I think the results and evidence show that New England has clearly out-performed the Packers in terms of building a team. They’ve drafted well but they’ve really utilized free agency and the trade wire well. Seattle has also. While the Patriots and Steelers have just helped themselves this off-season in free agency and trades, the Packers have done nothing but lose Heyward and Raji, and add nobody. Don’t worry though: Thompson has nine selections in next month’s draft. The problem is Seattle and New England also will be drafting. They also will have young guys improve from last year. ~Recently, coach Mike McCarthy made a “joke” about free agency and Ted Thompson, the Packers, by saying “maybe we’ll shock you”. While it would be nice to add talent at numerous positions prior to the draft, filling some holes, I’m going to try and be a bit realistic, and add just one unrestricted free agent. I’d like to add an inside linebacker or two (such as Mason Foster and Sean Weatherspoon, who both will be very affordable), and would like to add a great receiving back in Matt Forte. So with that laid out, here we go. By now, you’ve heard and seen many people besides us advocating for the addition of a tight end, including Green. He won’t be cheap. It will take someone besides Ted Thompson to reel him in. Besides having to spend a lot, it will take some “recruiting” as there will be many other teams bidding for his service. Thompson is not the charismatic guy who can do this. He didn’t have to outbid and outsell anyone for Charles Woodson, Ryan Pickett, or Julius Peppers. Green will take some work. But he’s worth the effort. His combination of size and speed alone make him worthy of being rated ahead of the top tight end in the draft, Hunter Henry, and anyone else below Henry. Green’s blend of size and speed are superior to all entering this draft. But unlike rookies, we’ve already seen what Green is capable of doing on Sundays. In fact, we saw him make Clay Matthews look like a rookie when he easily beat Matthews for a touchdown last year at Lambeau Field. It’s true, the Chargers are going to try and keep him, and he probably would love to stay there. But they still want to keep Antonio Gates. They also might leave San Diego. And oh by the way, the Chargers have no prayer of winning any Super Bowls. These are edges the Packers have over the Chargers. But the bottom line will be money. Green is worth the extra green. He’s special, and he’s very similar to what Jermichael Finley used to be. That weapon made everything easier for the wide receivers. We’ve seen Trader Ted trade up in the draft before a few times, to select OLB Clay Matthews, and ILB Terrell Manning. We’ve seen him trade back many times. This year, he shocks us again when the #17 Atlanta Falcons logo suddenly switches to the Packers “G”! The Packers finally have their anchor in the middle of the defense. Two years ago, there were rumblings the Packers wanted either CJ Mosely or Ryan Shazier, but they were each snapped up right before the Packers pick came up. The consolation prize was good as Ha Ha Clinton-Dix was the guy who fell further than expected. Last year, 95% of Packer fans were screaming for one of the ILBers who were all available when the Packers pick came up (Eric Kendricks, Denzel Perryman, or Stephone Anthony), but Thompson bypassed all of the inside backers, only adding Jake Ryan much later in the draft. The defense isn’t why the Packers season ended, however. They were good. But they can become great. The defensive line is solid, Clay Matthews, Julius Peppers, Mike Neal and Jayrone Elliott are a very good set of OLBers. The defensive backs are potentially as good as any in the NFL with quality cornerbacks and safeties, and everyone is still fairly young. Finally, the Packers add the thumper in the middle. From Carolina with Kuechly, to Denver with Trevathon, to Seattle with Bobby Wagner, having a stud in the middle is critical to a defense being great. Thompson should have learned that in 2012 & 2013 when San Francisco shut down the Packers season with the great defenses, anchored in the middle by Patrick Willis and Novorro Bowman. All that’s missing is the anchor in the middle, and that’s where Reggie Ragland comes in. He’s a thumper. He’s great against the run, and most scouts believe he’s decent in coverage. Adding him, and immediate starter and upgrade, does a few things. Besides making the team better against the run, he makes them more physical. It also means that Jake Ryan doesn’t have to start if Sam Barrington returns to form. – Correa will likely transition into a full-time 3¬-4 outside linebacker as a pro. While he doesn’t have as much play strength as expected and is still raw as a pass rusher, NFL teams will be attracted by his quick-twitch athleticism and moldable traits as a pass rusher. The tape says Day 3 of the draft, but the upside will get him called earlier. He might require patience as there is still work to be done for Correa. Although the defense carried the Packers most of 2015, Thompson gives Capers another playmaker with this pick as well as trading up in the investment in Ragland. Correa is relentless attacking the backfield. With Matthews, Peppers, Neal, and Elliott, he won’t be needed early and will learn while he makes a special teams impact early. This might be a head-scratcher, but with Starks being let go, the Packers feel the need to add a potential bell cow to pair with Eddie Lacy and John Crockett. I still wish the Packers had Rajion Neal from last year as I believe that former SEC running back was good enough to help the Packers. In addition to having great bloodlines, Taylor also has good hands and can run many routes. He’d be a nice addition to Lacy and Crockett. Was a 5-star recruit. Remember, there have been many great NFL RB’s who ran 4.6’s at their combines, including former Gator Emmitt Smith, and Arian Foster. Adding another SEC back like Taylor could result in a steal, if Lacy fails to stay healthy or get in shape. Taylor, like Clay Matthews, obviously has great bloodlines. His father, Fred, was sensational in the NFL rushing for over 10,000 career yards. I think Kelvin’s best days are ahead of him, out of the SEC. I can remember a few other SEC backs who did more in the NFL than they did in college there (Terrell Davis, Georgia, Arian Foster, Tennessee). The offensive line and quarterback play for the Gators was awful while Taylor was there. I believe he will blossom in the NFL, especially on the Packers. Nice job in the screen game to quickly read in the open field, making defenders miss with patience and cutting ability. Reliable ball security – zero fumbles in his career (510 touches). Pushes himself and considered a hard worker by the Florida coaches (“He’s what you want in a player” Gators coach Jim McElwain said). Although there isn’t much that separates him as a runner, Kelvin Taylor is quick, reliable and tough, projecting as a No. 2 runner in a NFL backfield. 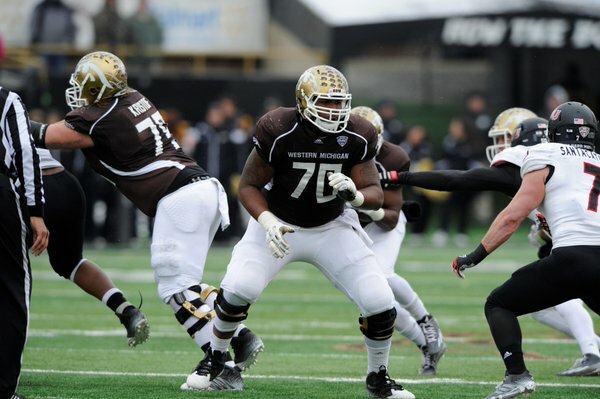 Although he started three years at left tackle at Western Michigan, coaches (at the Senior Bowl) had him working at right tackle as well as guard during practices for the All-Star game, and Beavers said he was open to the other positions. Beavers has years of experience at left tackle, but has also shown the ability to play right tackle. The Packers need depth at tackle. STRENGTHS: Sports a compact, athletic frame, with good overall weight distribution. Fires off the ball, showing an explosive burst to penetrate gaps when lined up inside at defensive tackle. Asked to play all over Stanford’s defensive line, Shittu shows surprising anchor to hold up to double-teams, as well as the initial burst, agility and flexibility to evade blockers. Even when initially contained, Shittu’s light feet and active hands make him a nuisance. Shittu was too much to handle for the Iowa Hawkeyes and their normally-good offensive line, in the Rose Bowl earlier this year. He chops his way through offensive linemen, showing a quick over-arm swim move and body control to “get skinny” and redirect. Shittu has a terrific motor, chasing ballcarriers laterally and downfield in pursuit. He brings his hips as a hitter, arriving with a thud. Showed resiliency in bouncing back from a serious knee injury (and resulting surgery) in 2014 to enjoy a breakout senior season to cap his career. Viewed by some as an ascending prospect whose best football is still ahead of him. Shittu certainly left the Cardinal on a high note, recording eight tackles, including 3.5 for loss and 1.5 sacks, against Iowa to earn Rose Bowl Defensive MVP honors. Allison made some money at the Shrine Game, hauling in two touchdowns among his four receptions. After leading the Illini in receptions (65) and receiving yards (882) to earn Honorable Mention All-Big Ten honors in 2015, scouts knew he could catch. But Allison’s all-around game during the week earned him high marks from scouts. Allison goes up with his 6-3 frame to make a leaping, spinning catch. He also not only takes a hit from the safety, but he actually “delivers” the hit as he shrugs the hit off and sends the safety to the ground. STRENGTHS: Looks the part of an NFL receiver with a tapered, athletic frame including long arms. Good initial quickness off the snap, showing the smooth acceleration to eat up the cushion and force cornerbacks to commit. Possesses the straight-line speed to challenge as a traditional vertical threat. Changes directions efficiently, displaying uncommon agility and balance to create separation as a route-runner or to generate yardage after the catch. Generally reliable hands, typically plucking passes away from his frame. Tracks the ball well over either shoulder, showing good hand-eye coordination, body control and focus to make the tough catch even with defenders closing in and the sideline a factor. Possesses a huge wingspan and the timing to take full advantage of his height to win contested passes. Competitive. Looks to get involved as a blocker downfield, showing physicality and tenacity. Enjoyed a terrific week of practice (and caught two touchdowns in the game) at the East-West Shrine Game to cap a breakout senior campaign. IN OUR VIEW: Teams looking to inject some big-play potential at receiver will be sure to consider Allison, a late-blooming vertical threat with the length and athleticism to project as a fourth receiver relatively early in his career and perhaps developing into much more with time. Virtually nobody in attendance at the E-W practices knew anything about the 6-foot-4, 300 pound Canadian player (including NFL Scouts), but his play on the field forced everyone to quickly take notice. Onyemata dominated nearly everyone he lined up across from in practice while mostly playing out of position at defensive end. “I think the better place for me is playing inside, but we had too many defensive tackles here so they moved me to end,” Onyemata told Football Insiders. For a guy with virtually no tape like Onyemata, the Shrine provided a real chance to get on the radar. Since he’s so fresh on the NFL radar it’s difficult for anyone to truly project where he could be selected in the draft. For a guy who has only been playing football for five years, his upside is tremendous. I suspect someone will probably take him before the Packers pick here. I’d take him in the sixth round, but that pick was traded to move up and get Ragland. I’m hoping he’s still around for us in the seventh. NFL Draft 2016: Could this be the Packers’ latest 1st Round SHOCKER? ~Ted Thompson is not afraid to go against the grain when it comes to both the NFL Draft and Free Agency. Probably a flag in the NFL, especially if it’s on a marquee QB. Picking late in the first round almost every year, it’s not easy to predict who he is eyeing. First, he’s pretty renowned for utilizing the Best Player Available strategy, so it could be almost any position. Second, there are thousands of possible combinations of things that could happen in the 26 picks before Thompson is on the clock, so anything could happen. There will be guys who are taken before him that the Draftnik geniuses (Kiper, McShay, Mayock, and the CBS, and other draft sites) have going in rounds two and three. But there will also be a handful of guys available at 27 who were usually long gone by then, in the majority of public pre-draft mocks. Two years ago, Ha Ha Clinton-Dix was gone by the Packers slot in about 99% of mock drafts. Six years ago, Bryan Bulaga (as well as Dez Bryant) were gone by the Packers slot in 99-100% of pre-draft mocks. As we now know, they were all still on the board when the Packers pick was up. Similar story in 2009 when B.J. Raji was still sitting there at #9. He, and WR Michael Crabtree from Texas Tech, were “supposed to” have gone much earlier, but were available when the Packers pick came up. Conversely, who had the Packers taking “safety” Damarious Randall in the first round last year? Nobody, aside from Thompson. Mike Neal in round two? Wasn’t even mentioned. James Jones in round three back in 2007? Nope, he wasn’t on anyone’s radar. Did anyone have Thompson trading UP to select inside linebacker Terrell Manning from NC State a few years ago to solidify the Packers linebacking corps? Nope. So here’s the thing: Nobody knows. And just because the mock professionals say this or that, it doesn’t mean anything. With all that out of the way, I am going to try and find the possible “surprise” choices that Thompson might grab this year. I won’t feature anyone who I see as a popular mock pick to the Packers. I’m looking for the Randall, Quinten Rollins types, the Justin Harrell, James Jones, etc. picks who were seemingly “out of the blue” guys. My first guy is outside linebacker/DE Emmanuel Ogbah from Oklahoma State. He’s an immigrant from Nigeria, who’s pretty raw. His story reminds me a little bit of Jason Pierre-Paul (South Florida, from Haiti), as well as fellow Nigerian Christian Okoye. I’ll take “raw” when it’s a player who has obvious talent and athletic ability. Ogbah does. He also has “on field production“, not just combine “underwear Olympic” test numbers. Ogbah has more sacks and big plays made than either of the Clemson guys, Shaq Lawson or Kevin Dodd. And he tested better in Indianapolis. His 40-time was faster than Khalil Mack posted two years ago, although only by .02 of a second. Ogbah has played with his hand on the ground as well as standing up. I think he can be a beast of an edge rusher on Capers’ system as an OLB. Can he have a Khalil Mack/Von Miller type impact? I think it’s possible, especially with Clay Matthews on the opposite side. Mike Neal and Nick Perry are both free agents, and the Packers will most likely lose one, if not both of them. At the Combine, Ogbah showed that he possesses the speed needed to get past NFL offensive tackles. 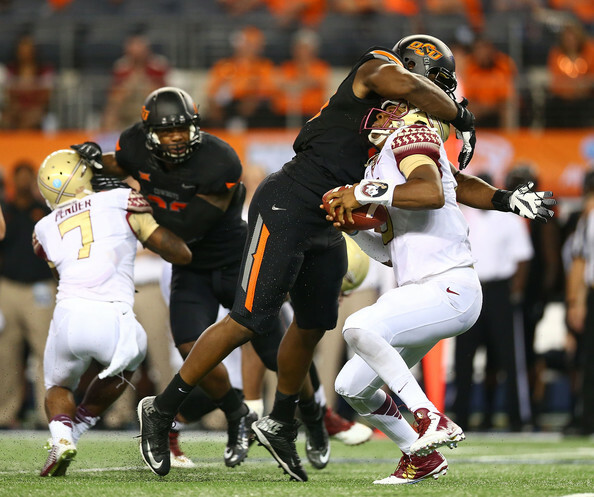 INDIANAPOLIS – Former Oklahoma State defensive end Emmanuel Ogbah had an impressive day at the 2016 NFL Combine Sunday, ranking among the top three defensive lineman in the 40-yard dash, vertical jump and broad jump in the on-field workouts. Ogbah’s 40-yard dash time of 4.63 seconds was the second-fastest among defensive linemen at the event, while his vertical jump of 35.5 inches was also second and his broad jump of 121 inches ranked third. To put his 40-time in perspective, it was faster than both Carolina Panthers cornerback Josh Norman’s and San Francisco 49ers quarterback Colin Kaepernick’s times when they ran the event at previous years’ NFL Combines. Emmanuel Ogbah, DE, Oklahoma State: Ogbah wasn’t hailed as one of the top pass rushers in the draft prior to the combine, despite an impressive résumé that featured 24 sacks over the past two seasons. But his name is flying up boards after a dazzling display in Lucas Oil Stadium that showcased his combination of size, strength, speed and explosiveness on the turf. Ogbah clobbers Jameis Winston back in 2014. Ogbah posted a 4.63-second 40 time, as well as remarkable measurements in the vertical jump (35.5 inches) and broad jump (10-1). Although he is strictly a straight-line power rusher off the edge, Ogbah’s athleticism, force and production will make it hard for coaches and scouts to ignore his potential as a top prospect. Noah Spence, DE/OLB, Eastern Kentucky: Scouts are having a hard time dubbing Spence a premier pass rusher after witnessing his so-so performance on the turf in Indianapolis. He recorded a pedestrian 40 (4.80) that pales in comparison to the times clocked by a few elite pass rushers with similar physical attributes: Von Miller (4.53) and Khalil Mack (4.65). In addition, he didn’t appear to flash the same first-step quickness and burst in bag drills that allowed him to dominate opponents at the Senior Bowl. Although Spence’s final evaluation will be based primarily off the game-tape evaluation, the fact that he failed to impress as an athlete will make it hard for some teams to consider him an elite prospect on draft day. This is a sight the Packers want to see. So according to the odds, there’s a slim chance this guy will be Thompson’s pick. But it’s possible, and based on the things we’ve seen and heard about Ogbah, it might be a good thing. Stay tuned. See more of Ogbah here from Harris Highlights. Film doesn’t lie. ~Here’s an early look at 50 players who figure to fit into these layers of the draft (underclassmen are denoted by asterisk). Based on interviews with executives in personnel for five teams, it is possible to narrow down just a little bit the pool of players that might be considered by the Green Bay Packers regardless of position if they exercise their current 27th selection in the first round of the NFL draft April 28. 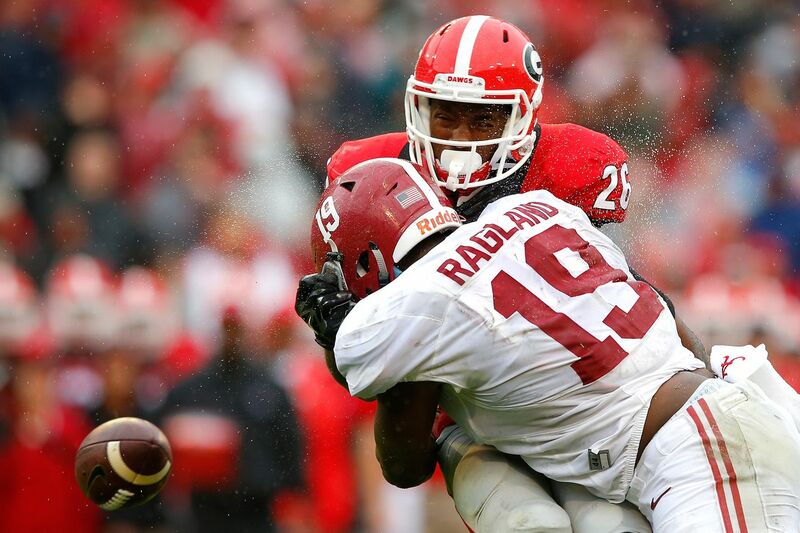 ILB Reggie Ragland; would be the perfect pick for the Packers, but he won’t be around when their pick is up at #27. Prospects are conservatively divided into three categories: As Good As Gone – barring negative developments, these players have virtually no chance of reaching No. 27; Probably Gone — players who appear to have no better than a 50-50 chance of remaining on the board at No. 27; and The Next Level — players who figure to fall next. The Packers have their own selection in all seven rounds. They’re also likely to be awarded at least one compensatory pick next month for the free-agent losses of cornerbacks Tramon Williams and Davon House in 2015. Laremy Tunsil*, T, Mississippi: 6-5, 310. Started 28 games at left tackle. “Outstanding athlete,” one scout said. “Long arms. Moves well. He played against some of the best pass rushers in college football and shut them down. Tough.” Doesn’t work to finish blocks on a consistent basis. “He might be a little lighter on his feet than (Ronnie) Stanley,” a second scout said. Top-five pick. Ronnie Stanley*, T, Notre Dame: 6-6, 312. Junior left tackle. “Good player, but I don’t think he’s special,” said one scout. “He’s in the top seven, eight (picks). He’s a better player than the Giants took at No. 9 last year (tackle Ereck Flowers).” Not a great worker and doesn’t always play hard. Three-year starter (39 games) at LT. “He needs to get stronger,” another scout said. “He probably has the best pass set. He’s really good technically as a pass blocker. Left tackle.” Extremely long arms (35 5/8 inches). A’Shawn Robinson*, DT, Alabama: 6-4, 307. Third-year junior. “He doesn’t play with the same consistency that (Jarran) Reed does,” said one scout. “He’s not stiff. He can play 3-technique or 5-technique. I don’t like him as a nose because he plays tall.” Started 30 of 42 games, finishing with 9 sacks and 22 tackles for loss. Won’t turn 21 until next month. “Big run stuffer with pass-rush ability,” one scout said. There’s a chance that DL A’Shawn Robinson is still on the board when the Packers’ pick is on the clock. If so, I would expect Ted Thompson to add this guy to his defensive line. DeForest Buckner, DE, Oregon: 6-7, 291. Started 38 of 54 games. “Comes in and starts,” one scout said. “Not as dynamic obviously as Bosa. More of a run-down player for a 3-4 team, but he has some pass rush to him.” Finished with 18 sacks and 36 tackles for loss. Wonderlic score of 9. Widely regarded as a better prospect than former Duck DE Arik Armstead, who went 17th last year to the 49ers. “They play a two-gap 3-4 there,” said another scout. “He’s got a chance to be an impact guy. He kind of plays all across the front.” Hands measured an incredible 11¾ inches. Laquon Treadwell*, WR, Mississippi: 6-2, 221. Bounced back from a gruesome leg injury in November 2014 with 82-catch, 1,153-yard final season. “Most likely he is the first wide receiver taken, but that’s not a slam dunk,” one scout said. “He’s a physical, stronger guy. DeVante Parker last year was a very similar player. Good route runner.” From Crete, Ill. “He’s big, has made some great catches and can run with the ball,” another scout said. Ezekiel Elliott*, RB, Ohio State: 6-0, 225. Two-year starter with 592 carries for 3,961 yards (6.7) and 43 TDs. “He’s a complete three-down back,” one scout said. 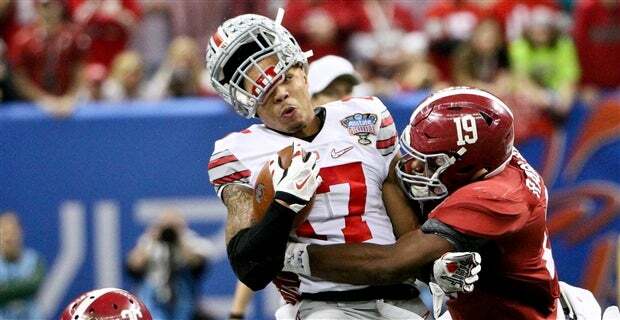 “He’s really good.” Stunned some scouts by telling reporters after loss to Michigan State that he didn’t get the ball enough and was done as a Buckeye. “Declaring for the draft and making those statements right after a loss were very disappointing,” another scout said. “Is he a selfish player? Is it all about him? He’s going to have to answer a lot of questions.” Ran a 4.47 40. Kevin Dodd*, DE/OLB, Clemson: 6-5, 277. Fourth-year junior. “He’s a little better than (teammate) Shaq Lawson,” one scout said. “Really came on. His best games were probably the last six in his career, which always helps. Quality kid, all that stuff. He’s a 4-3 DE pass rusher or an outside backer in a 3-4.” Had 12 sacks in 39 games (15 starts). Shaq Lawson*, DE, Clemson: 6-3, 269. Third-year junior. “Top 25,” said one scout. “Pass rusher. Long arms. Really came on this year. Played behind (Vic) Beasley in the past. Totally different than Beasley. Beasley was a speed rusher. This guy’s got speed and athleticism. He’s just a bigger guy.” Posted 20 sacks in 43 games (16 starts). Sheldon Rankins, DT, Louisville: 6-1 1/2, 299. Undersized 3-technique with 29 starts in four seasons. “He’s a move guy,” one scout said. “If you put him at nose and don’t move him you’re going to be wasting him. He can run. He’ll play at 315, 320.” Models his game after Aaron Donald, J.J. Watt and Geno Atkins. “I can play in any scheme and all three downs,” he said. Emmanuel Ogbah*, DE/OLB, Oklahoma State: 6-4, 273. Fourth-year junior. “Whoever takes him will get an excellent player,” one scout said. “He can play any position except nose. He does what they tell him to do. He plays the defense.” Consistent production (28 sacks, 36 starts) over three seasons. “Good effort player,” another scout said. “Very explosive. Late first, early second.” Arms were 35 1/2. OLB Ogbah might be the guy the Packers take. Corey Coleman*, WR, Baylor: 5-11, 194. Caught 173 passes for 3,009 yards (17.4) and 33 TDs. “Really dynamic player,” one scout said. “Got a ton of catches and big plays. It’ll take a little bit of time when he comes in the league just like all the Baylor receivers because they don’t run a route tree. There’s a development to his game that he needs.” Compared by another scout to Anquan Boldin. Josh Doctson, WR, Texas Christian: 6-2, 202. Caught 35 passes as a true freshman at Wyoming before transferring. “He’s got great hands,” one scout said. “He may have the best hands of the bunch.” Late-season wrist injury that required surgery concerns some teams. “He’s very similar to (Laquon) Treadwell,” another scout said. Tyler Boyd*, WR, Pittsburgh: 6-1, 197. Established school records with 254 receptions and 3,361 yards (13.2) in three seasons. “Very smooth,” said one scout. “Good hands. Good route runner. He has a chance to be in the latter part of the first (round).” Ran a disappointing 4.58. Hunter Henry*, TE, Arkansas: 6-5, 250. Moved to the head of the tight end group after Alabama’s O.J. Howard returned for his senior season. “It’d be a reach to take a tight end in the first round,” one scout said. “He’s not a dynamic, special athlete, difference-maker like some of the tight ends that have come out recently. Like Eric Ebron or Jordan Reed or Tyler Eifert or Zach Ertz or Travis Kelce. All those guys had more athletic-receiver traits than this guy.” Much faster than Green Bay’s Richard Rodgers and has comparable hands, according to another scout. “He’s a complete tight end,” said one scout. “More of a pass catcher but he’s got enough size to block.” Started 30 of 38 games, finishing with 116 receptions for 1,661 (14.3) and nine TDs. Jack Conklin*, T, Michigan State: 6-6, 308. Walk-on from Plainwell, Mich., who earned scholarship shortly after his redshirt season. “He’s a mass blocker, not an explosive blocker,” one scout said. “I think he’s a guard or a right tackle.” Started 35 games at LT and three at RT. “He’s a typical Big Ten offensive lineman,” another scout said. “Big, tough, nasty. Late first round.” Added a third scout: “Finisher. Doesn’t have elite left tackle feet but his feet are good enough. Very consistent.” He compared Conklin to Green Bay RT Bryan Bulaga. 40 time of 5.00. Taylor Decker, T, Ohio State: 6-7, 310. Started all 42 games from 2013-’15 at LT. “He’ll end up being a right tackle,” one scout said. “OK athlete. Tough kid, smart, good length. He just ends up being so high he gets pushed. He’s better than the (Jack) Mewhort kid was.” Co-captain in 2015. “I’m not as excited about him,” a second scout said. “He does have some toughness and is pretty sound in his technique, but he’s limited athletically.” Just 20 reps on the bench press. Jason Spriggs, T, Indiana: 6-6, 301. Started 47 games at LT. “He may go late one or top of two,” said one scout. “Athletic kid. Had a good Senior Bowl. He’s got size, he’s got length and does have left tackle type feet. He’ll continue to rise.” Excelled in three other sports as a high school athlete. “Strictly a left tackle,” another scout said. “He is athletic. Maybe he sits a year and works his way into the lineup. Offensive linemen go (early) because there’s such a need, but I don’t see him being any more than a solid starter.” Turned in a sensational workout. His 40 time of 4.94 was the best among offensive linemen, and he did 31 reps on the bench. Cody Whitehair, G, Kansas State: 6-4, 301. Four-year starter. “He was a college left tackle but will be a guard,” one scout said. “Probably the best guard in the draft. Very steady. Always in great position. Great feet. Knows how to play.” Handicapped to an extent by short arms (32 inches). “He’s stiff,” said another scout. “I’m not as enthused with him as other people. Real smart guy.” Hurt himself with merely 16 reps on the bench. Derrick Henry*, RB, Alabama: 6-3, 247. Heisman Trophy winner started just 17 of 41 games. “He’s very similar to (Eddie) Lacy,” one scout said. “He’s the workhorse.” Rushed for 2,219 yards last season, bringing his three-year totals to 602 carries for 3,591 (6.0) and 42 TDs. “Great kid,” another scout said. “Great production. Strong runner. Had a lot of wear and tear. Upright style of running.” 40 time of 4.54. Noah Spence*, DE, Eastern Kentucky: 6-2, 251. Ended up at Eastern Kentucky after being suspended indefinitely at Ohio State for failed drug tests. “Multiple trust things got him kicked out,” said one scout. “Some question marks about his character. Pass rushers are a premium, and he is that.” Had a strong week at the Senior Bowl. “He could go anywhere from 15 to 35,” a second scout said. “It’s all on the off-field stuff. All it takes is one team to be OK with it. Especially with guys like Randy Gregory…you get nervous.” Played well as an outside linebacker at OSU. Had 11 1/2 sacks in only season at EKU. Jonathan Bullard, DE, Florida: 6-3, 285. Started 36 of 50 games. “He had his best year (in 2015),” one scout said. “Thought about coming out last year. Helped himself. He’s been dinged up. More of a 4-3 DE than an outside linebacker. He’ll go second or third round just because of limitations on flexibility.” Posted 12 sacks and 33 1/2 tackles for loss. Kenny Clark might be a nice addition to the defensive line. Kenny Clark*, DT, UCLA: 6-3, 314. Third-year junior. “Very similar to Billings,” one scout said. “Good football player. Second round. He has always played nose.” A scout for a 3-4 team said Clark fits better as a 3-technique. “He has some pass rush in him,” the scout said. “Wish he was more consistent.” Two-year starter with seven sacks. 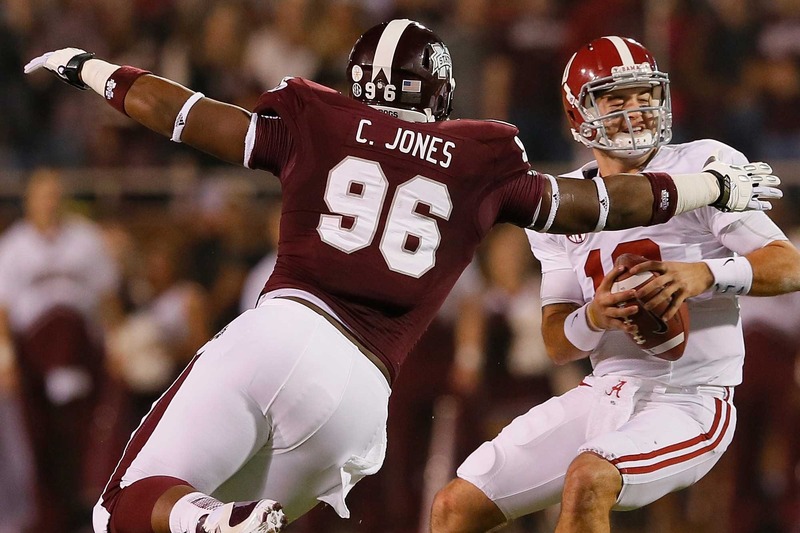 Chris Jones could be the guy Thompson chooses. Eli Apple*, CB, Ohio State: 6-1, 199. Redshirt sophomore renounced final two seasons of eligibility. “He’s raw,” one scout said. “He’s a man-cover corner. He’d benefit from not having to start right off the bat. Not getting beat early. The physical stuff is there. He gets by with size and speed but not really good fundamentals. That’s great on the college level where they allow you to grab downfield.” Had four picks, 18 passes defensed. Xavien Howard*, CB, Baylor: 6-0, 201. Fourth-year junior. “He probably has a chance to be a late first because of the height-weight-speed factor,” one scout said. “Top 50 for sure. Man-cover corner. Decent ball skills. He is tough to throw on. Not a lot of balls completed on him. He can run with almost all receivers. He tracks the ball well. Physical.” Picked off 10 passes in 39 games.